Are cherry tomatoes… Of course, it was inevitable. Initially, I let one self-seed and all these tomatoes are from that plant. I planted two Roma tomato seeds and, when they didn’t sprout, I planted another three but they didn’t sprout either so it’s just cherry tomatoes this year. I was determined to have only one cherry tomato plant but a seedling came up where I had planted a Roma tomato seed and I had high hopes it would be a Roma – I let it live. By the time I worked out it wasn’t, it was too late. It was already huge. Soon, this guy will be producing, too. I am doing my best to control them but, geez, it’s hard. When the one I had decided could live was young, I pruned all the shoots to about 30 cm from the ground and tied all the lateral shoots to the meshing. You wouldn’t know now. It is just a tangled mess like last year. Well, under the house, are bundles of onions. Actually, I have three bundles but I couldn’t get good photos of the other two. The bundles were accompanied by a background of buckets, piping, wheelbarrows, etc. so one photo will have to suffice. As you can see from this bundle, I have a mixture of red, white and brown onions. My favourite thing about growing onions is that you don’t have to eat them all at once. It is such a good feeling to go downstairs and pick an onion from the bunch whenever I need one. 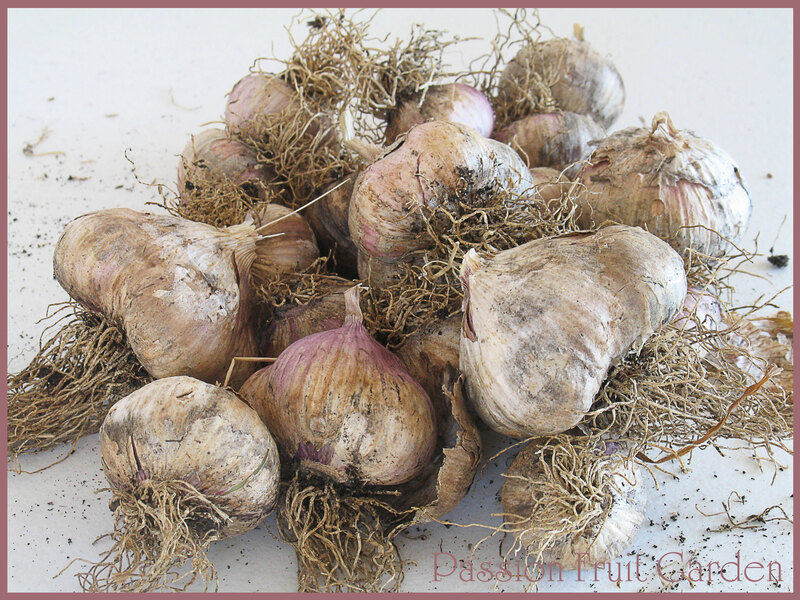 Is most of this year’s crop of garlic. 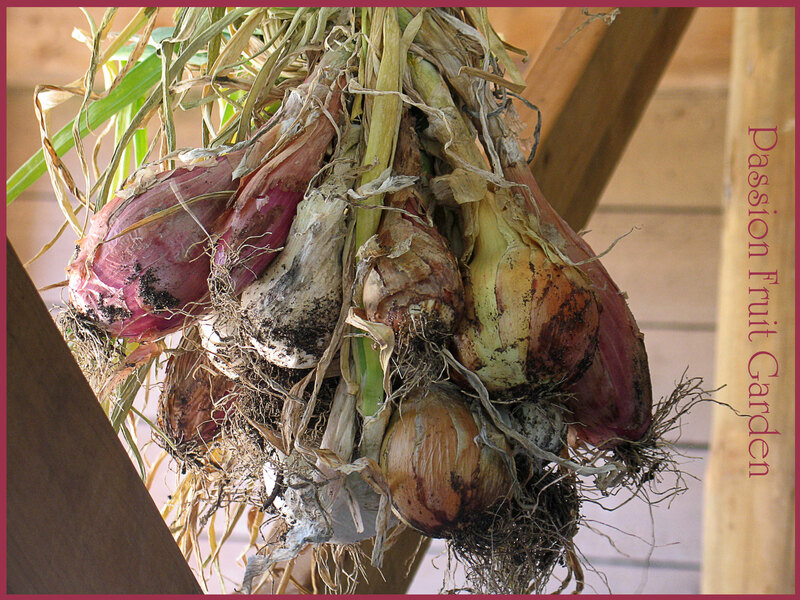 It was not the best year for garlic. The birds ate about two thirds of the cloves I put in and then what was left did not develop into very large heads. Still, along with what is in the freezer, this lot may just last us the year. Is rhubarb and loads of it. This photo doesn’t really indicate how big the pile was. Believe me, it was huge. I stored it over night in a large bin bag. As a consequence, I had to give Maus a talking to. I reminded her that I planted the rhubarb for her and I reminded her that, before I bought the crowns, I made her promise she would eat all that I grew. So now she must follow through with her promises. He! He! 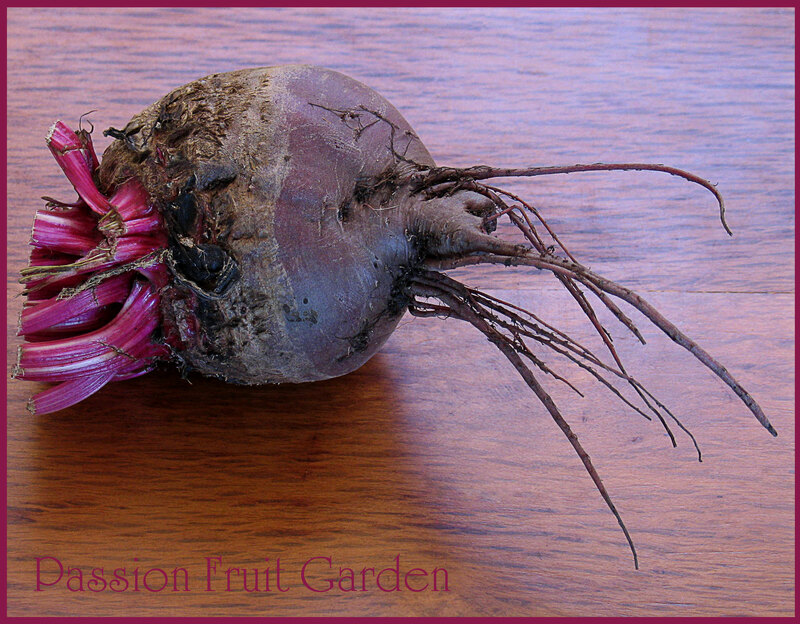 Is a beetroot. There were three, in fact, but this guy was the most photogenic. I only took a photo of him so I could talk about two beetroot I picked a couple of weeks ago. They were huge. One was pretty close to 3 kilos!!. I should have taken a photo of them. I didn’t because I was sure they would be all woody and disgusting and big is not often beautiful. But, when I cut into the big one, I was surprised. It was all nice and red and juicy. I used 900g of it to make some of Rick Stein’s infamous beetroot chutney. I put the balance into a big pot of dog food. The other one I gave to Maus’ brother to juice. He drinks lots of raw vegetable juices. I haven’t heard whether that one was as good. The beetroot I am picking is covered by the tomatoes. That is why some are huge. I have just missed them. 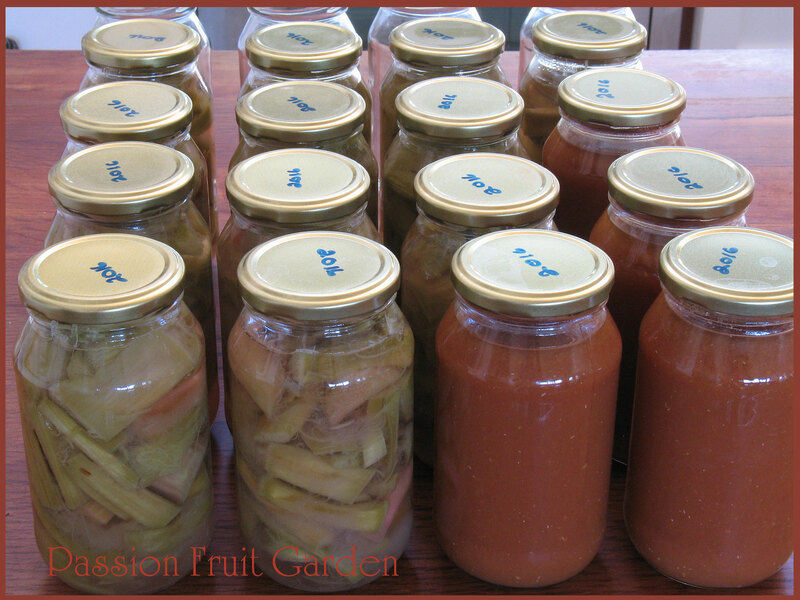 Are 12 jars of preserved rhubarb. This is the result of that huge pile of rhubarb. Are 4 jars of passata. They are the product of some of the tomatoes in the top photo. I also made a huge pot of Bolognaise with them. Cherry tomatoes are great for passata. I throw a handful, at a time, into a food processor and process until their skins are broken. Next, I put them into a large pot and simmer them for a while. Then into an electric mouli they go (you must get one, they are fab.). I re-boil the resultant juice until it is the consistency I like. Finally, I put the passata into 500 mil jars with ½ tsp salt and a 15 mil tablespoon of lemon juice and then process the jars in boiling water for 35 minutes. I will be doing this a lot in the coming months. Are 6 jars of beetroot chutney I made with part of that huge beetroot I was telling you about. The recipe actually made 12 jars – the other 6 are in Perth. This is our favourite chutney recipe. If you have some spare beetroot, I highly recommend it. Is some corn relish. As with everything else in the vegie patch, the corn ripened all at once. I made seven jars – the other three are also in Perth. 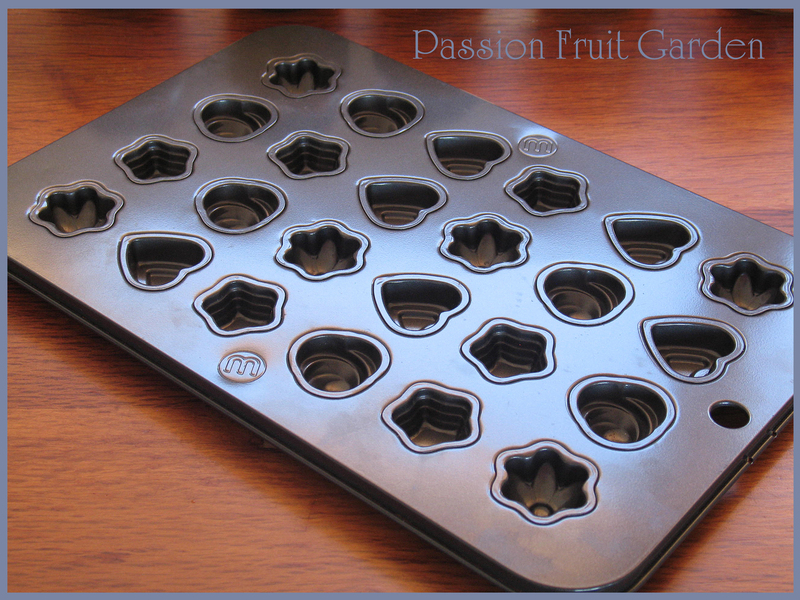 Is this great chocolate mould tray. My sister, Juanita, gave it to me. I think it was a re-gift. Someone gave it to her and she doesn’t make chocolates. I haven’t done much tempering lately. I think Maus’ observation that she did not think it was the hobby for me (I make way too much mess for her liking) has put me off. In any event, I am trying to eat less chocolate. I do still have a big bag of chocolate challets in the pantry so, maybe, when it gets a bit cooler, I will give tempering another bash. If I can’t make nice chocolates with such a great mould, I never will. It was my birthday in January so you’d think I’d be flush with new cookbooks and kitchen paraphernalia. Alas, no!! I think all my friends and sisters think I have enough (or too much) stuff In My Kitchen. But Maus, the darling that she is, did not let me down. 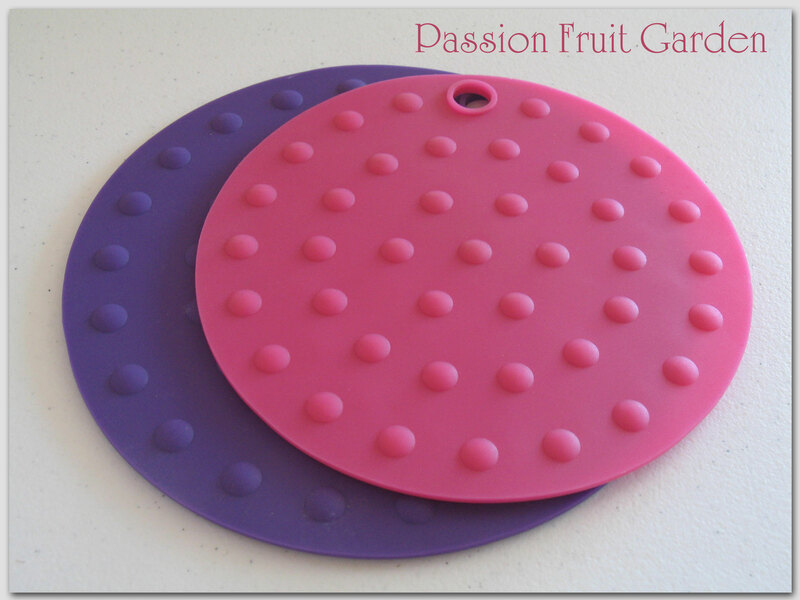 She saw these cute silicon trivets and bought them as a gift from one of my gorgeous Bichons. I am sure she bought them just because they are my colours but they are turning out to be very useful. They are great because they are not very bulky so they can be left on the bench without being intrusive. Then, when you want to put a pot down, one is sure to be near by. I think she got them from Woolworths – they come in other colours. My sister, Juanita, who has sworn she won’t buy me anything more for my kitchen, inadvertently bought me two kitchen items for my birthday. I mentioned to her that I needed pouring bowls in which to make my soap. Juanita bought me this gorgeous Chasseur bowl/jug. But it is way too nice to be out in the shed with all my soap paraphernalia so I have it in the kitchen. Juanita also bought me this bowl for my soap making. 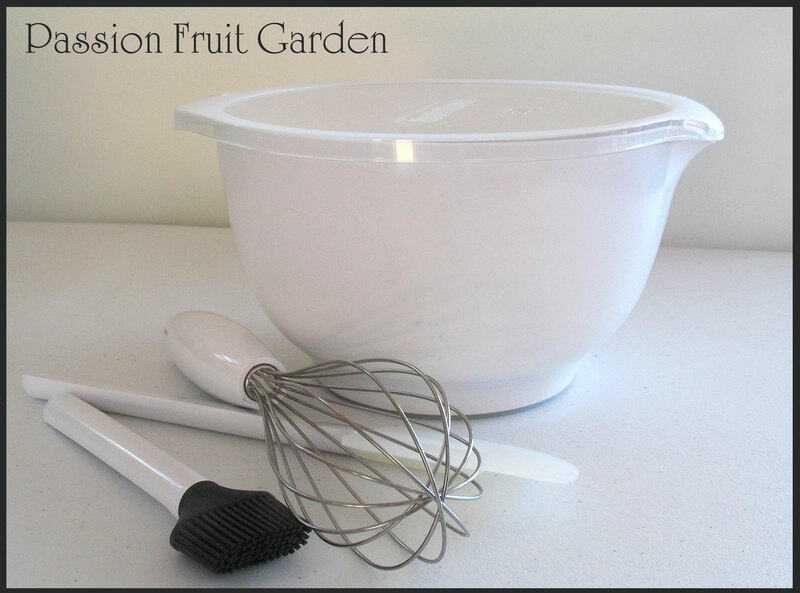 It came with the whisk, spatula and the silicon brush. I did use this bowl ONCE for soap making but, when I checked on the oil in the microwave, I noticed the bowl was hotter than the oil. I put the oil into another bowl and checked out the bottom of this bowl. It is not suitable for microwave so its no good for soaping. Yippee! Another bowl for my kitchen. The bowl is a Rosti Mepal. The Danish company Rosti and the Dutch company Mepal merged in 1993 to form Rosti Mepal. I have had several Rosti bowls for about thirty five years and they look as good as new. If this bowl is as good as those, it will see me out in bowls. It won’t be going in the microwave again. If you would like to see what is happening in other bloggers’ kitchens this month, visit Maureen at Orgasmic Chef. Maureen hosts In My Kitchen each month. 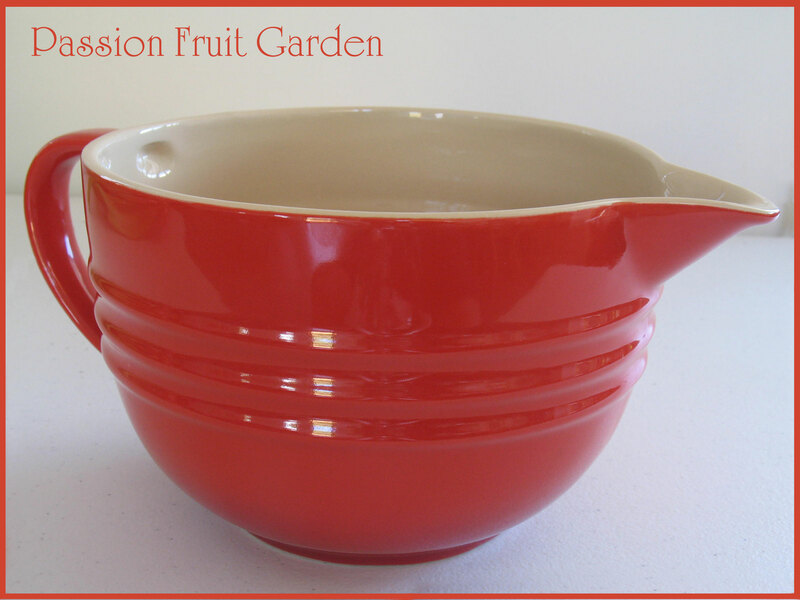 This entry was posted in In My Kitchen and tagged Chasseur jug, Corn relish recipe, How to preserve cherry tomatoes, How to preserve rhubarb, Rick Stein beetroot chutney, Rosti bowls, What to do with excess cherry tomatoes? by Glenda. Bookmark the permalink. all i can say is wow! that is a lot of preserving. so much fun to have jars of your own stuff in the pantry isn’t it? i like the sound of beetroot chutney tho i usually make mango in summer and nectarine chutneys. or is that chutnies? 🙂 and that red jug is delightful. Hi Sherry. I think it is chutneys :)I am not a big fan of nectarine chutney. We love beetroot chutney though. Oh my, you have a garden that keeps on giving I would say. All I can say is lucky you! 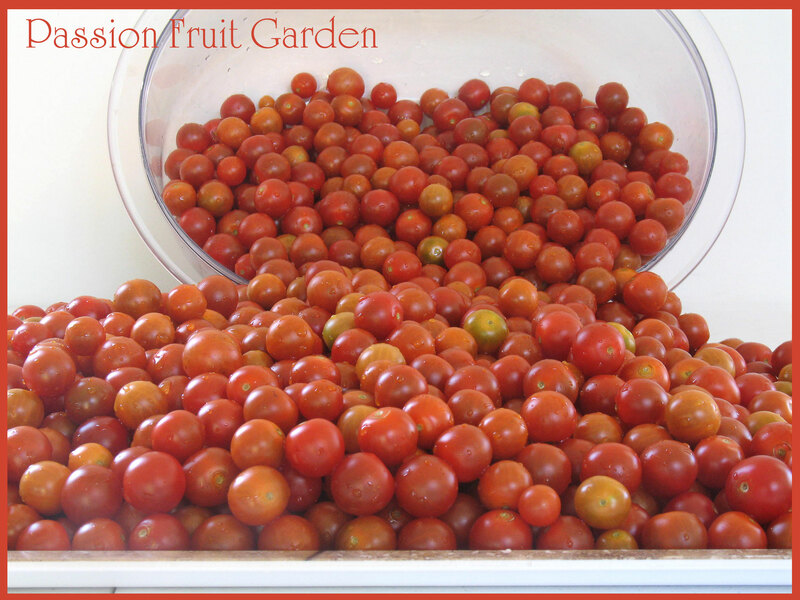 Your garden produce looks amazing – what an avalanche of tomatoes! You deserve high marks for all of the canning that accompanies such a good harvest. 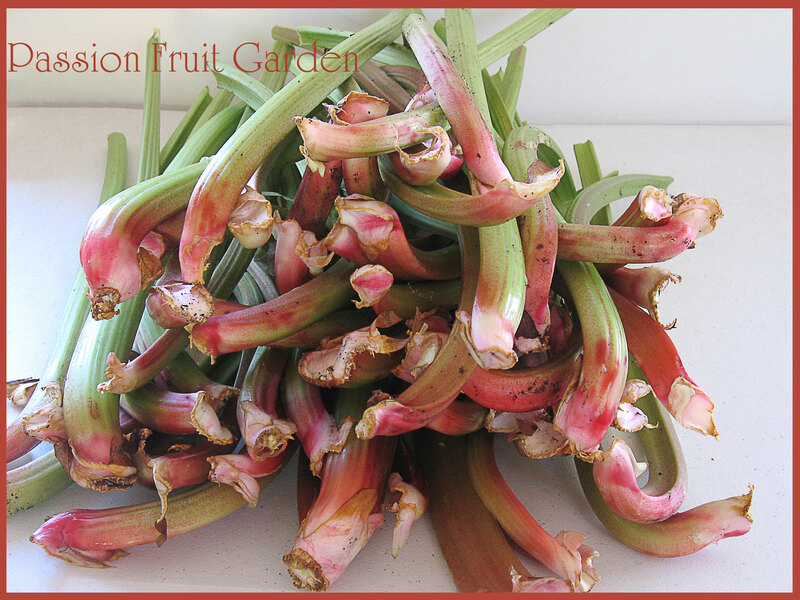 Is most of the rhubarb destined for the freezer, to use throughout the year? Hiya, I preserved all the rhubarb. We will use most of it in smoothies. Hey Glenda – long time no chat. We’ve had a very mild winter up until yesterday (now we’re in this polar vortex that’s freezing people’s faces off) – so no particular reason but I’ve had a case of the winter blues. Looking at all of your garden bounty makes me feel happy though. I still cannot believe though that all those cherry tomatoes came from one plant! The last time I put 3 cherry tomato plants in I got a total of 4…that is correct – FOUR – little bitty tomatoes. Must be the fertilizer. Hi Diane, Tomatoes like heat I don’t think you have the climate for them Diane. You have the winter blues, I have the summer blues. Winter in Australia is so much nicer than Summer. We had 4 days in a row over 40 degrees. Poor us. Corn relish brings back great childhood memories for me, on a fresh white bakers bread sandwich with cheese or cold meat it was a staple, and also mixed with cream cheese as a dip… which I still make. Before Christmas we received ongoing & prolific gifts of tomatoes then pffft… no one has any… but at least I made a good freezer stash while I could. Hi Ella, this recipe comes from Sally Wise’s book and Sally actually suggests making a dip with the relish. I must try it. We too are drowning in cherry tomatoes. I have been making large trays of slow roasted tomatoes and eating them on bread or tossing them in salads in an effort to reduce the glut. We don’t have as many as you though. We have given up on corn, but I also found some beetroot that had been hiding under the tomatoes. Hi Tania, What gadget is that? I believe a Thermomix is a great gadget for tempering chocolate and know you have one. We share the same birthday month Glenda, so a belated happy birthday. Like you my friends tell me I have enough kitchen stuff when it comes to birthday presents, but some end up giving in 🙂 Love the lovely red jug/bowl your sister gave you. As always beautiful produce from your garden and of course if we were neighbours I would be eyeing that rhubarb. Hi Moya. I hope I wished you happy birthday. If not,HB. Thanks for all the compliments. I just had some rhubarb and yoghurt. I have had a tooth out so I needed something soft. Tomatoes! What a surprise 🙂 You certainly have the tomato growing touch. 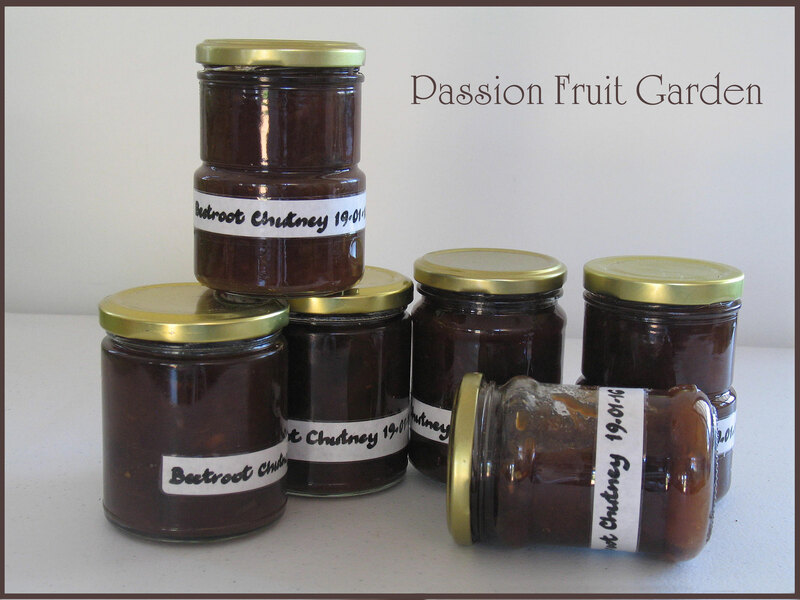 Love all the preserves that you make – I love beetroot chutney and also beetroot relish. Incidentally, rhubarb relish is good and also rhubarb pushed into foccacia sprinkled with sesame seeds. Hi Anne. I never knew you could use rhubarb for relish or chutney but Debi, and now you have mentioned it. I am going to check it out. Interesting idea with the focaccia. How much do you use? Hi Glenda. There’s some different ideas for using rhubarb in this post http://annewheaton.co.uk/2015/05/29/rhubarb-rhubarb-rhubarb/ with a link to the bread recipe. Hi – trying again…WP is not being kind to me today! 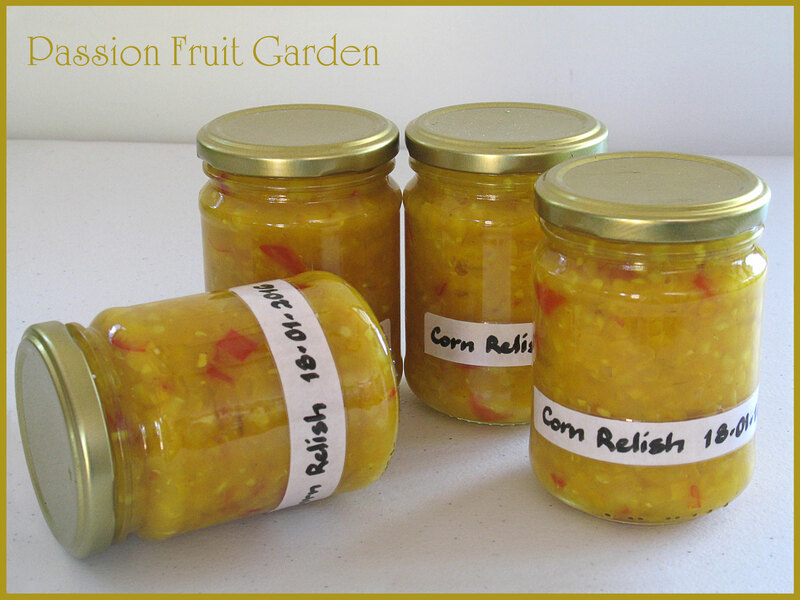 I said that corn is far too expensive here for me to make corn relish. Lucky you. That beetroot has alien like qualities. Wow, wow, wow Glenda. What a haul. Love the preserves! Oh, no, not tomatoes again! Scared me a little as I am currently nurturing a tomato seedling found in my new herb garden (brought in with the compost, I think). All of a sudden it sprouted, so I suspect it may be a cherry tomato. Poor Maus having to eat ALL that rhubarb, but I am sure you will find inventive ways of using it. Rhubarb chutney is nice. Hi Debi. I have never heard of rhubarb chutney. I will have to check it out. Thanks.